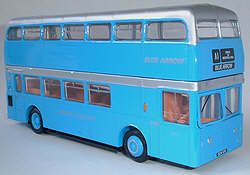 The Fleetline was Daimler's first rear engined double deck chassis. Introduced in the late fifties the Fleetline was to continue in production until the mid 1970's, by which time Daimler had been absorbed into the state owned Leyland Truck and Bus organisation. The early MCW and Park Royal bodies shared similar designs and were popular choices for many operators experimenting with one man operated buses, or replacing older rear entrance crew vehicles. These particular body designs remained in production until the late 60's. In 1965 London Transport decided to carry out an experiment comparing the Fleetline and Leyland Atlantean rear engined double deckers. Only eight Park Royal bodied Fleetlines were purchased, and these were allocated to the Country area's East Grinstead garage where they operated route 424. These XF class vehicles all passed to London Country Bus services in 1970, where they continued to operate mainly on route 424 until their withdrawal in the early 1980's. Both versions covered here first appeared in the range in 1994. 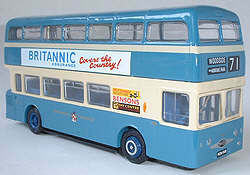 The models all share the main body casting from the Leyland Atlantean (165), the only variation being a different casting for the rear engine. The MCW version has a engine bustle, while the Park Royal version has engine shrouds producing a flush rear side profile.